Walser has designed a business model that allows you to work with one person from greeting to delivery. Think of it as your own automotive concierge service. It’s a simplified process which offers you a pleasant, stress-free buying experience. At Walser we display a low market price on every vehicle to make your experience fast, fair, and stress-free. We have a team dedicated to continually researching the color, age and availability of each vehicle in the market to ensure that our prices are low, fair and competitive. Walser pioneered negotiation-free selling in 2001. We offer low, transparent, up-front pricing without the hassle of negotiations required at other dealerships. There are no hidden costs at Walser. Buying a car is quick, easy and straightforward – completely transparent. Walk right in or visit our web site and get our everyday low price right up-front, fair market value for your trade-in and competitive finance rates. Buy with complete confidence! All purchases at Walser come “worry-free” with our exchange and return program. If your vehicle is not a perfect fit, just return or exchange it undamaged (some restrictions apply). 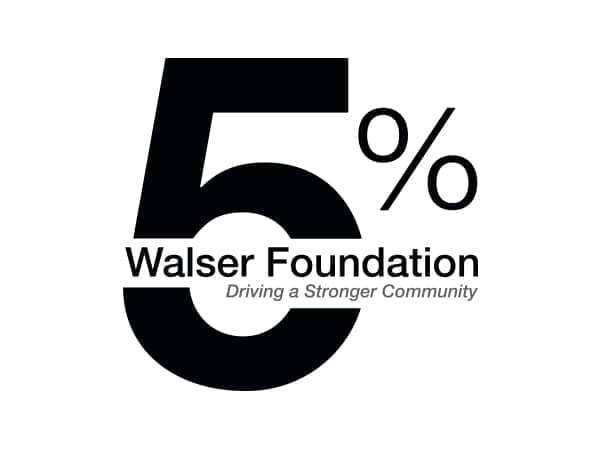 The Walser Foundation provides grants to organizations that benefit education at all levels, as well as those organizations that help build a strong workforce for the future. Our mission is to increase access to high-quality programs – from pre-K to post-secondary – in the Twin Cities and Wichita communities. *Return a vehicle within 3 days or 300 miles or exchange a pre-owned Walser vehicle for a different Walser new or used vehicle during your first 30 days of ownership and get 100% of your Walser Best Price back towards the next vehicle (excluding tax difference, accessories, license and documentation fees). Vehicle must be in the same physical and mechanical condition as it was during original delivery. A mileage limitation of 1,500 miles applies to exchange and 300 miles for returns. The customer is allowed to return or exchange one vehicle per year. If customer exchanges their pre-owned vehicle for a new vehicle, that exchange is only eligible for the new vehicle’s brand sold by the original selling dealership. If customer exchanges their pre-owned vehicle for another pre-owned vehicle, that exchange also must be facilitated at the original selling dealership. If the vehicle is financed, customer must qualify for financing on the new vehicle. In-stock vehicles only exclude sports cars and specialty vehicles.